On Thursday, June 21, Melania Trump's "I Really Don't Care. Do U?" jacket sent shockwaves across social media. 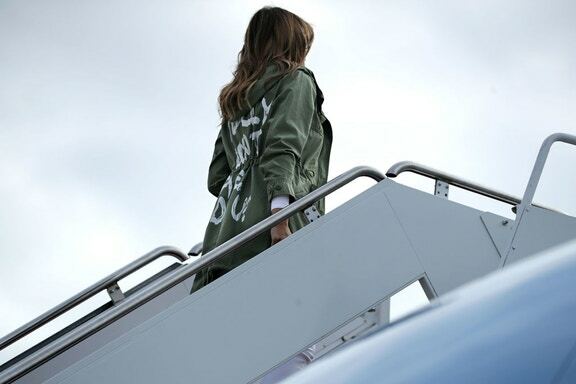 As she was boarding a plane following a surprise visit to a U.S.-Mexico border facility, the first lady was photographed wearing a jacket that read "I Really Don't Care. Do U? People were understandably upset. The stories surrounding families separated after attempting to cross the border has broken hearts and sparked outrage. More importantly, hundreds of thousands of people have been inspired to take direct action to help reunite families. Upworthy writer Parker Molloy came up with an ingenious response by acquiring the domain rights to ireallydocare.com("I Really Do Care") where people can make streamlined donations to a number of organizations working on immigration issues. Just two hours into the campaign, more than $100,000 had been donated through the site. At a time when people were feeling outraged, it's another perfect example of leading people who do care toward meaningful action and having your voice heard. If you want your voice heard, sometimes you have to wear your values on your back. Literally. PSA Supply Co., a commerce site recently launched by our parent company, GOOD Worldwide Inc., has followed Parker's lead by turning her re-design of Melania Trump's jacket into a T-shirt that you can purchase here. 100% of the proceeds will go directly toward United We Dream, the largest youth-led immigrant network in the United States. Visit PSA Supply Co. to get your T-shirt today. 100% of the proceeds will go directly toward United We Dream, the largest youth-led immigrant network in the United States. We can't always stop bad things from happening, but how we respond says so much more. Here's your chance to be heard. At a time when so many people are still trying to process what is happening with immigrant families separated at the border, it's OK to be outraged. It's OK to be heartbroken. But what we choose to do next matters. Supporting groups that are fighting to protect immigrant families will send a message to those in power that dignity, justice, and human rights are universal values worth fighting for.